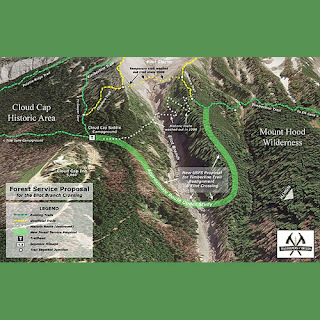 After being impassable for the past decade, the Timberline Trail will finally be reconnected after a debris flow washed out a part of the trail in 2006. The Trail, one of the most iconic hikes in the Pacific Northwest, traverses around Mt. Hood, offering spectacular views of Hood and other mountains in the Cascades. The Timberline Trail has always been one of the very best hikes in the Pacific Northwest. #A nearly 40-mile trek around the peak of Mount Hood, the trail offers stunning angles of the mountain as well as views of the other giants of the Cascade Range: Mount St. Helens, Mount Rainier, Mount Adams, Mount Jefferson and the Three Sisters. #But for the last decade that loop has been incomplete – cut off after a 2006 debris flow washed out a seasonal bridge and large chunk of the trail near the Eliot Glacier field. The closure has forced hikers to cut their treks short, or else find more difficult paths across. #Thankfully, those hiking headaches will soon fade. The U.S. Forest Service announced this week official plans to reconnect the 40-mile trail, via a 1.5-mile re-route. Trail construction is expected to begin this summer, with the projected completion coming sometime in 2017. #The announcement comes after years of complaints from local hikers. #Kloster outlined a proposed reconnection at the time that appears to be the template for the official forest service proposal today. His idea would save the forest service from implementing a “million dollar” solution, he wrote in the blog post, utilizing a seasonal plank bridge to cross the creek at a better location. #Whatever the new trail ends up looking like, it will be a welcome relief to hikers looking to complete the 40-mile loop.